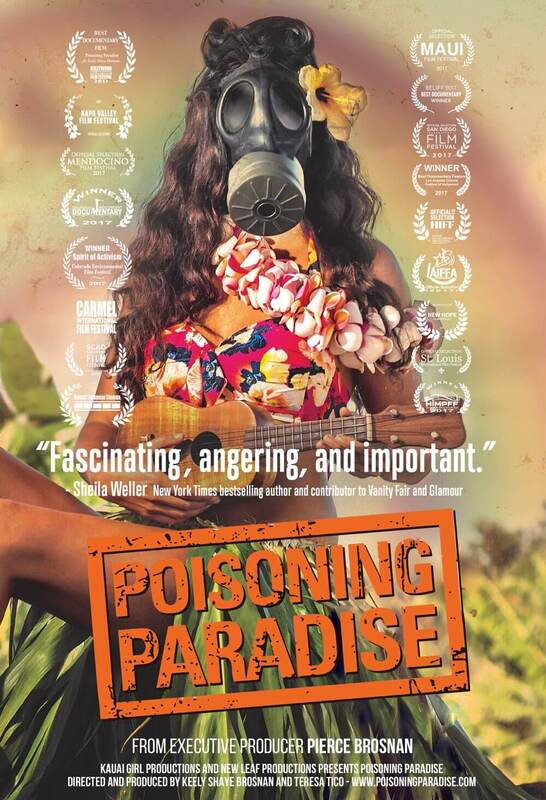 “Poisoning Paradise,” produced by Pierce Brosnan, about pesticides in Hawaii. 7 p.m., Friday November 2, room 101 BPMC, 50 Sharpless St, West Chester, PA 19383. What are your health risks from chemical exposure? Let’s talk about it. Sponsored by West Chester University, Sierra Club, PennFuture, PennEnvironment, and Don’t Spray Me! Expert panel, Q&A, activities for children, refreshments, tours of the LEED-certified Business and Public Management Center, community group displays. Brief presentation of 2018 awards by West Goshen supervisor Chris Pielli and SEPA Sierra Club leader Jim Wylie. Park across Sharpless St. in the public parking garage or in metered spaces on Sharpless or Church St. (on-street parking should be free on this evening; check wording on the meter). Environmental film series, first Fridays in fall, film at 7 p.m.; doors open at 6:30. WASHINGTON— America’s national wildlife refuges are being doused with hundreds of thousands of pounds of dangerous agricultural pesticides every year, according to a first-of-its-kind analysis by the Center for Biological Diversity. There are two axioms that have inspired me in my involvement to save open space. The first is Margaret Mead’s point that a small group of thoughtful people can change the world. The second is that we should think globally but act locally. And both of these were certainly true the first time I got involved fighting with a small group against the destruction of a local place known as Beaver Valley on the DE PA border. A politically connected developer wanted to build 450 ticky tacky houses in a 325 acre publicly subsidized wildlife refuge that had been open for public use for 40 years. In late 2012, when the plans were introduced, things looked really grim and our mood reflected that. Few in the group believed we could win. Some were just hoping to scale down the plans and make them less egregious and reduce the traffic impact. Everyone thought it was a done deal since the supervisors in Concord Township were advocating for the development in various newspapers. 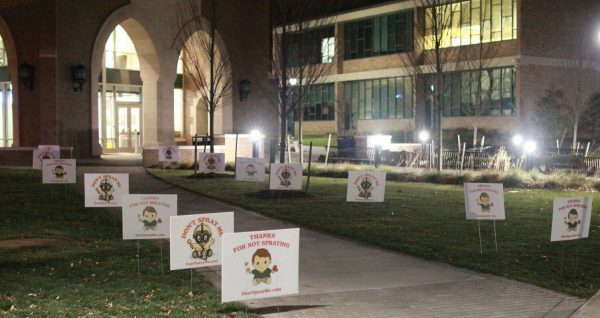 Nevertheless, a few of us felt that we could fight city hall and save Beaver Valley. So we formed a second group called Save the Valley and we hunkered down knowing it would be a long fight. We held rallies and protests. We built a massive Facebook presence. We published dozens of our own articles. We sent mailers. We put flyers on windshields all over the Brandywine Valley. Grew our email list. We canvassed. We got in the newspaper, on the radio, and TV. We flooded public meetings, at one point turning out 1,000 people to a meeting in May of 2013. We were everywhere and relentless. And we won. We didn’t settle for a smaller development. We didn’t settle for a little less traffic. We saved all of it. Five years later, that wildlife refuge in Beaver Valley will be added to the First State National Historical Park and will be permanently protected. With that success showing what was possible, someone mentioned to me what Toll Brothers wanted to do to Crebilly Farm right down the road on 202. I went to a meeting at Stetson Middle School and I dove in head first with Neighbors for Crebilly. As many of you know, Crebilly Farm is one of Chester County’s most iconic farms and a place that saw action with Hessians during the Battle of the Brandywine on September 11, 1777. During WW2, German POWs built a barn on the property. And yet all of this history and beautiful open space would be lost if Toll Brothers were to plop 317 of their plastic houses on this hallowed ground. But Toll didn’t expect people to organize and fight back. And that’s what Neighbors for Crebilly has been doing for the last year and a half. The fight now heads to court and we’re in this for as long as it takes to save Crebilly Farm. If I could boil my involvement with open space advocacy down to one common truth it would be this: you don’t have to take it. You can fight back against corporations and a government that enables them. Small groups are having an impact and effecting change all over this country. If you think that your voice won’t be heard, that you’re too small to fight back just remember that one woman saw the damage that DDT was doing to our environment and she did something about it. But she didn’t just write Silent Spring cataloguing the harm of a pesticide, she devoted herself to seeing its use banned. And the movement Rachel Carson started was successful in having DDT banned. To invoke John Kennedy, don’t ask what others are doing to protect YOUR environment. Ask what you can do to help. You can join Sierra Club volunteers working to circumvent the federal government to get municipalities to commit to 100% renewable energy. You can join Del-Chesco United for Pipeline Safety fighting Sunoco’s Mariner East 2 dragonpipe. You can sign up with the Don’t Spray Me group organized to stop the unneeded spraying of toxins in our communities. You can get involved with the group fighting to clean up the old Bishop Tube site in East Whiteland. You can join Neighbors for Crebilly and fight for our landscapes and history. Or you can organize your own group to fight some other environmental injustice. But, remember, we lose the right to complain about things when we refuse to get involved. When we refuse to become part of the solution, we are part of the problem. But, if you’re willing to work, you can win. We won in Beaver Valley and we will save Crebilly Farm. And you can win, too. But you just have to put your shoes on and get involved. You don’t need your entire community to support you. It only takes a small group of thoughtful people to change the world. Nothing is ever a done deal. 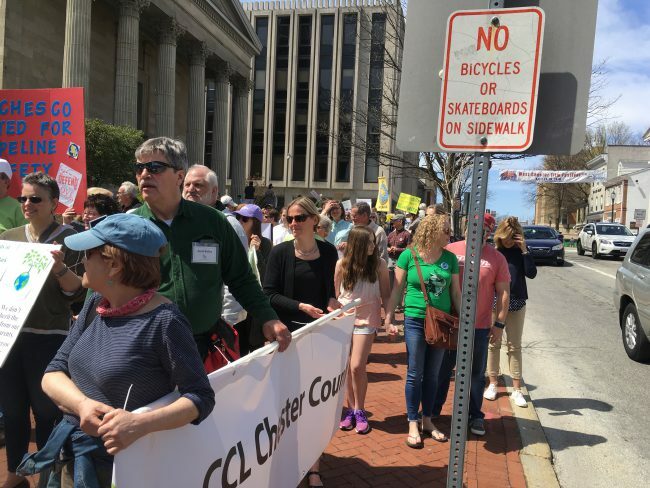 WEST CHESTER >> Mother Nature couldn’t have smiled more brilliantly on 150 Earth Day demonstrators participating in the “March for the Environment” Sunday in the borough. 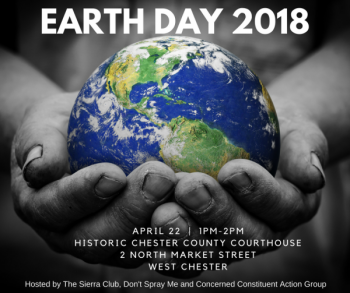 Sunny skies and temperatures in the high 60s embraced those supporting sustainable energy, a healthy environment and preservation of the environment, at the historic Chester County courthouse steps Sunday afternoon. We did it last year, with 200 attendees, great speeches and an effective march. 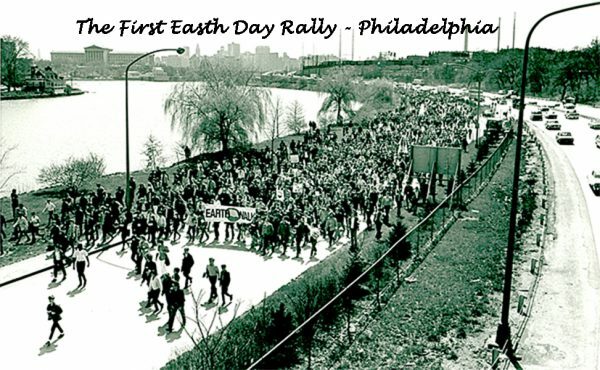 Now we are aiming for at least 100 more people to rally and march in West Chester on Earth Day, April 22! 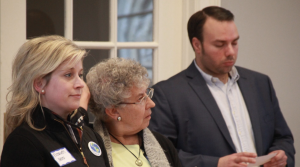 You could say Chester County is lucky to have preserved so much open space, to have a consensus to prioritize clean air and water, to build parks and trails, and to promote renewable energy. Or, you could say residents, municipalities, county government, non-profits, and foundations have worked really hard at it. Members of all participating groups, and all concerned citizens, please join us to reaffirm our determination to protect air, water, climate, vulnerable species, open space, and human health! And be part of bringing many groups together with added strength to celebrate Earth Day and our environment, in 2018 and beyond! • Rally at the Historic Court House, 2 North High St., West Chester. 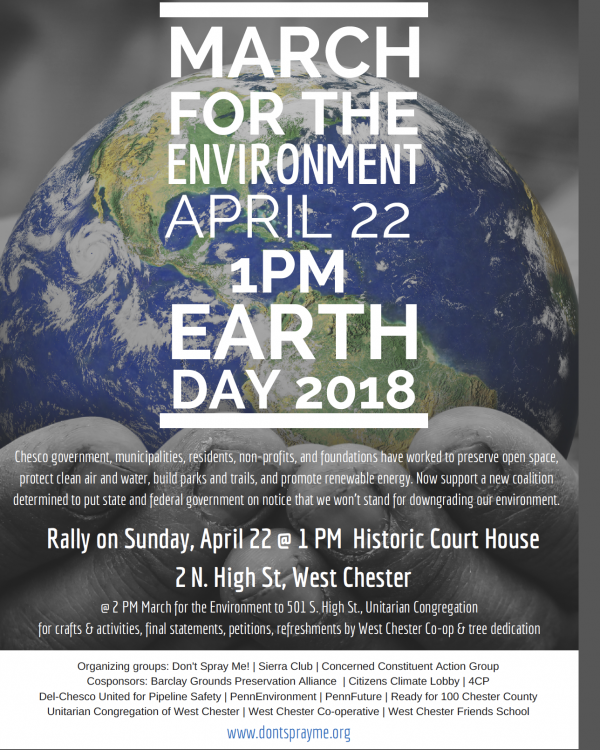 At 1pm, we will gather to listen to speakers, including: PA State Representative (156th district) Carolyn Comitta; West Chester Mayor Dianne Herrin; Open Space Advocate and Southeast PA Sierra Club Executive Committee Member Ken Hemphill; and former West Chester Mayor Jordan Norley. Rev. 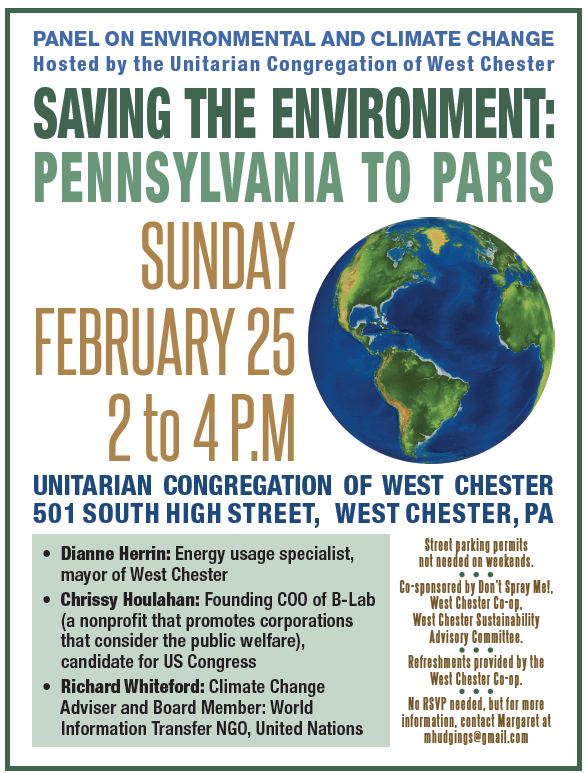 Dan Schatz, Minister of the Unitarian Congregation, West Chester, will perform environmentally-oriented songs. Claire Witzleben of CCAG will be master of ceremonies. • At the Unitarian Congregation, 501 S. High St., wrap-up session, final statements, environmental petitions and attendee list, tables with participants’ info, refreshments by West Chester Co-op, tree dedication, child-oriented activities (coloring postcards, decorating reusable shopping bags, potting small trees to plant at home), etc., till about 3 p.m. If you drive, park in parking garages or on the street as permitted. 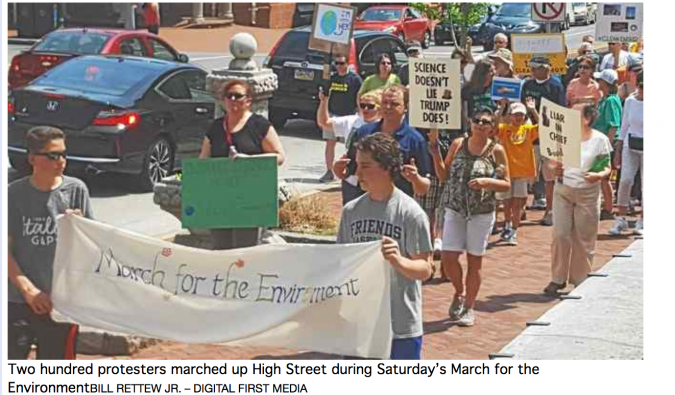 This photo by Bill Rettew is reproduced with permission from “Hundreds rally in West Chester to support the environment,” Daily Local News, 4/29/17. 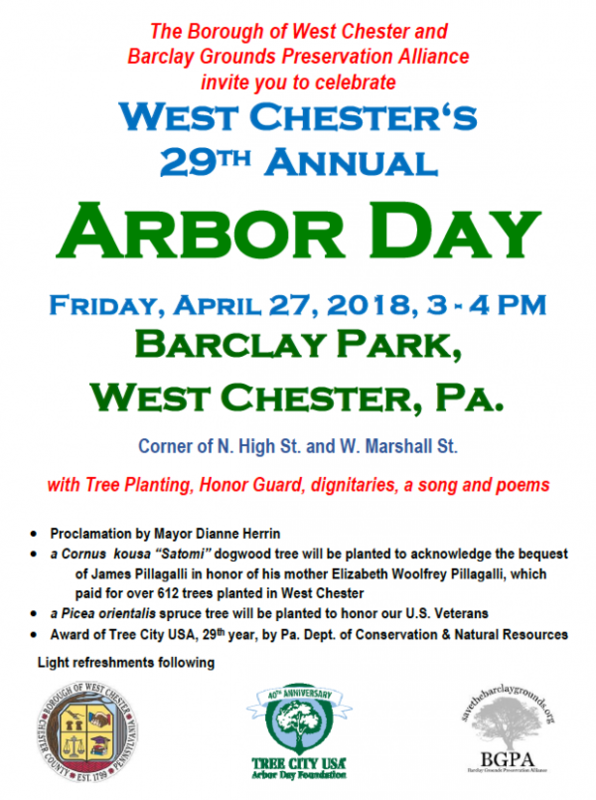 West Chester mayor Dianne Herrin has proclaimed 2018 “The Year of the Tree.” Along with their esthetics, shade, and feeling of urban comfort, trees are a great way to cleanse impurities and also CO2 out of the air. In honor of trees, then, here is a poem by Katherine Gallagher, born in Australia and living in England, The Guardian in 2012. See also the nicely done video here. The poem was published in Carnival Edge: New and Selected Poems (2010). to carry a tree as daily rite. picking up rubbish, scraps of paper. the start of a forest. it’s a tree, not a gun. On Sunday, February 22nd, a coalition of environmental groups led by Don’t Spray Me! sponsored a panel of experts at the Unitarian Congregation of West Chester, with an audience of about 90 people. • Richard Whiteford, environmental activist, a founder of the local Sierra Club branch, noted climate change speaker and writer, Board Member of World Information Transfer NGO, and participant in the Paris Climate Conference of 2015. Richard spoke to the unseemly subsidies that our government gives to the fossil fuel industry. That funding should go to renewables. Fortunately, he said, some states, universities and towns are stepping into the gap left by a delinquent US government. • Dianne Herrin, Mayor of West Chester since January, founder of BLUER (a coalition of local leaders advocating for reducing carbon emissions), former head of the Borough’s Sustainability Advisory Committee, and initiator of the Environmental Bill of Rights passed by West Chester citizens. 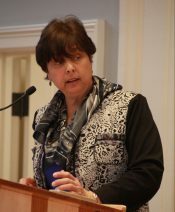 Among other themes, Dianne spoke to West Chester’s renewed commitment to urban trees and to the growing realization that nature has rights too. She also brought out that natural gas is not a “bridge to clean energy” and that Pennsylvania’s Public Utilities Commission is actually hostile to renewable sources of energy. • Chrissy Houlahan, engineer and businesswoman, veteran, chemistry teacher, founding COO of B Lab to promote civic responsibility in companies, and a 2018 candidate for Congress. Chrissy emphasized that the legal framework exists for corporations to choose to be good environmental citizens (known as B-Corps: Benefit Corporations). The panelists responded to audience questions ranging from issues related to pipeline safety to business responsibility to Paris Climate Agreement challenges. Asked about local consequences of global warming, Richard Whiteford predicted an increasing likelihood of “rain bombs” (with something like 8″ of rain in 2-3 hours), species extermination, and the total breakdown of Philadelphia’s storm runoff system. Chrissy Houlahan added that climate refugees, particularly from Africa, will be causing worldwide dislocations. Questions were sorted and posed by a non-partisan group including Matt Holliday, Elizabeth Moro and Jessica Cadorette. As summarized by moderator Sheila Burke’s: participants feel a sense of urgency to solve environmental issues; people want to be involved; and we can be very heartened by the large number of people stepping forward. Exhibitors at the display tables included Citizens Climate Lobby, Delco United for Pipeline Safety, Don’t Spray Me!, Food and Water Watch, Penn Environment, and the West Chester Co-operative. It has been a goal of Don’t Spray Me! since its founding in 2015 to open up dialogue about environmental issues and to engage in community education. 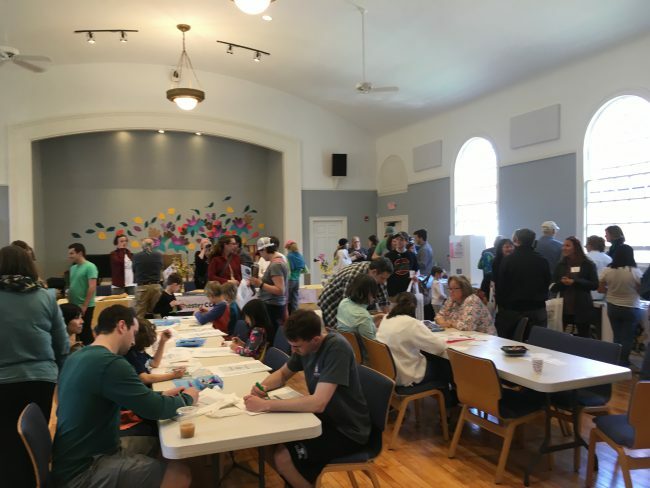 This event built on the environmental film series at WCU in the fall of 2017, which was created in collaboration with Sierra Club and the University’s Sustainability Program and was preceded by the Earth Day celebration of April 2017. About 70 people gathered on Thursday evening December 7 to view “The Wisdom to Survive,” the final film of the fall in the West Chester University Environmental Sustainability Film Series in memory of Graham Hudgings. The hour-long documentary at WCU’s new LEED gold-certified Business and Public Management Center was sponsored by Don’t Spray Me!, Sierra Club of Chester County, West Chester Food Co-op, WCU’s Office of Sustainability and Sustainability Advisory Council, the WCU Geography Club, and Chester County Citizens for Climate Protection (4CP). After snacks from the Food Co-op, a tour of the new LEED-certified building, and conversation over environmental exhibits, MC Sheila Burke introduced featured speaker Elizabeth Moro, Pennsbury resident and co-founder of Neighbors For Crebilly, which is striving to preserve the large farm south of West Chester as open space. 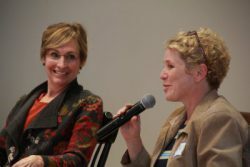 A long-time supporter of environmental actions, Elizabeth was energized by the current political morass to the extent that she is running for the PA 7th U.S. Congressional seat. Elizabeth explained that she grew up near Lake Huron, where she learned that “Mother Nature doesn’t negotiate – she’s in charge.” Humans used to work in harmony with nature, but now we need to get back to seeing the big picture that we are part of. Money is not a good way to evaluate importance. Try holding your breath, she told the group, and see at what point you’d rather draw a breath than collect money. She has helped raise funds to preserve part of the headwaters of the Brandywine near Honey Brook, Barnard’s Orchard in Pocopson, and now Crebilly Farm in Westtown.